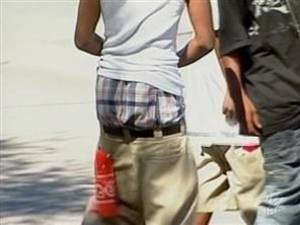 Saggin' Pants: A Desperate Cry For Help? Saggin’ Pants: A Desperate Cry For Help? Our youth are in pain. They appear menacing because they yearn for that connectedness. We have been too busy for them. They want love but have settled for the fear in your eyes as a cheap attention substitute. Show them love & watch the “rebellious predator” melt away. Saggin’ pants are a sure means of getting the attention that they crave by any means necessary. Anyone who feels thoroughly loved has no time for such buffoonery. Ignore the monkey outfits that are manifested from that mentality and speak directly to the hurt little boy and pained little girl that exists deep down inside who only wants to be loved and reassured. Take time to give them love and attention unconditionally and watch the difference in their demeanor almost instantaneously! At first they will resist and you may have to endure a verbal assault or too because of the neglect endured previously in their lives. Allow your love for them to stand strong in the cleansing of their pain as you may have to stand proxy for that one who did them wrong until they absorb and understand that you DID them NO wrong. Touch a life in this manner young or old and you will be responsible for a divine metamorphosis that can never be overturned in their live! Kids grow up to emulate what they have experienced in their formative years and for you to alter a negative momentum into a positive one is a gift given that can never be taken away. While I am all for tough love and an ultra strict disciplinarian, compassion and understanding must be at the foundation of all corrective intentions when dealing with our youth. They will only duplicate what is given to them and if we don’t aggressively counteract what the media is dishing out in the form of the negative lyrics in these songs and the warped realities that are taken as the norm in these reality television shows, then these cheap substitutes will fill in the void that was left by us in the jobs that we were supposed to do and there will be absolutely no elevation from one generation to the next and we will only have ourselves to blame. We must take full responsibility for what we observe happening in our communities and take an active stand even if we stand alone in our quest for improvement in the beginning, eventually others WILL follow! Previous : My Legacy: Sharing My Blessings With Others Who Are Not As Fortunate!